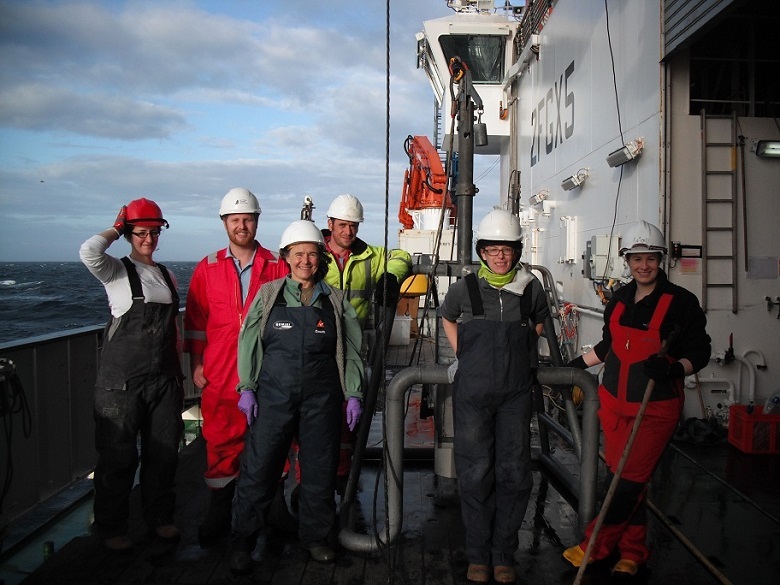 UK Shelf Sea Biogeochemistry Blog: Working with mud! This is our first SSB cruise, as well as our first cruise overall!!! Exciting stuff! On the second benthic cruise we are responsible for doing lots and lots of coring, i.e. lots of mud to shovel off the side of the ship!! Sarah’s work, who is mainly responsible for all the fauna (the beasties) that live in and on the seabed, involves both the NIOZ and the SMBA box corer. These corers collect a 0.1m2 and a 0.5m2 sample of the seafloor, respectively. Epifauna is collected with the Jennings trawl, a 2m net that is very slowly dragged over the seabed – the nets collect lots of bivalves, starfish and sea mice (furry and iridescent worms! Yes, really! ), snappy Nephrops norvegica (scampi!) 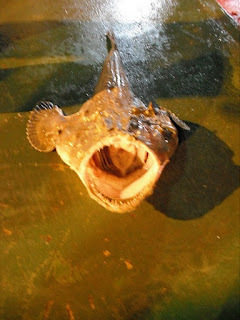 and sometimes even some monkfish, which we don’t keep! 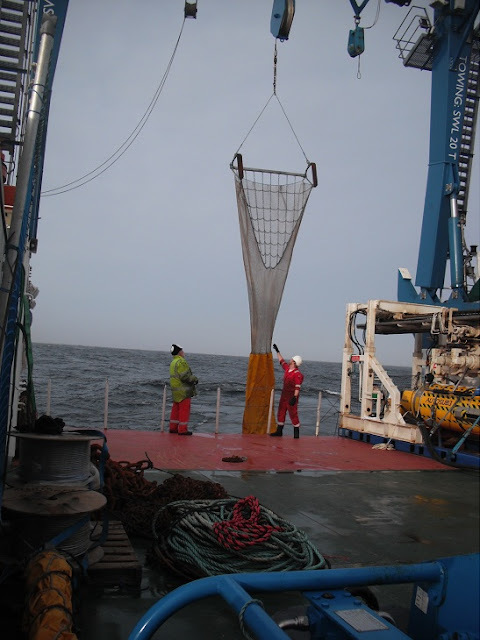 Jo is responsible for the flux coring. Here, we also use the NIOZ box corer, but each core is shared by several people. It is Dave who collects for nutrient flux incubation, Gangi who collects cores for oxygen profile incubations, and Helen who collects cores for a pulse-chase experiment. 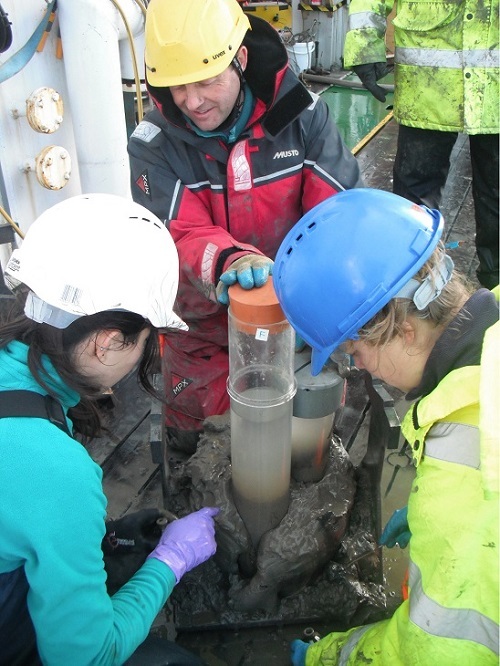 This experiment quantifies the exchange of nutrients between the sediment and the overlaying water. Jo sub-samples around everyone else: 50mL syringes for pigments and microbial analysis, surface scrapes for nitrification rates, and, the most fun of all, 10cm diameter cores for denitrification rates, which get whizzed up with a blender-like piece of kit. The samples are treated with different chemicals to stop the nitrification process at different stages, incubated for a minimum of 24 hours and fixed with zinc chloride. Finally, they are ready for analysis when we return back to PML. 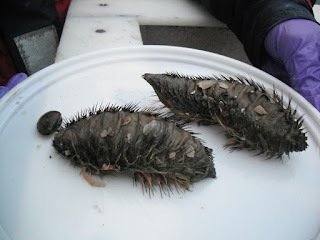 The fauna that we have collected from the trawls and cores will be identified, counted and weighed when we return to the benthic lab in PML. This information together with the microbial data and the chemical analyses can be statistically analysed to discover whether there is a relationship between them. Finally, this information can be added to enhance marine models such as ERSEM (the European Regional Seas Ecosystem Model) which then will be used to predict how the marine environment may change in the future.